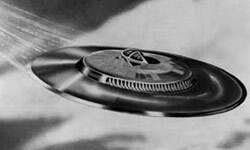 In conjunction with Quarles' evening press conference, reporters were given access to copies of Project Blue Book Special Report 14 as well as an artist's conception of the MX-1794 "Silver Bug" saucer. The wording of the press release appears to have been carefully crafted to permit the Air Force an "out" in the event that the Baku objects turned out to be real Soviet vehicles. 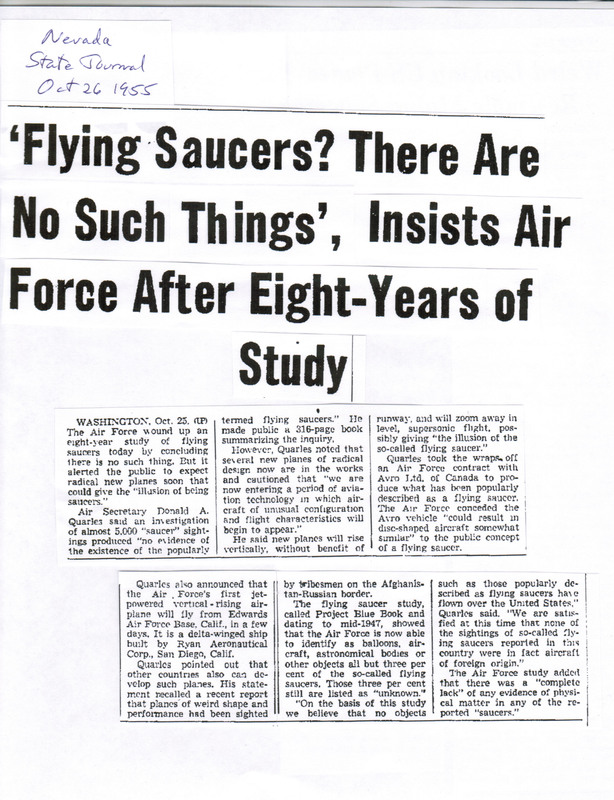 By stating that none of the sightings in the US were believed to be aircraft of foreign origin, Quarles could simultaneously allay domestic concerns and leave open the option of recognizing the existence of Soviet saucers. Quarles' revelation that the Air Force was about to fly a new jet-powered VTOL aircraft referred to the Ryan X-13 Vertijet, the tiny, delta-winged tailsitter that had been in development for several years (the X-13 made its first flight -- in horizontal takeoff mode with temporary conventional landing gear -- on December 10). In his page one story on the release of Special Report 14, the New York Times' Tony Leviero noted that "the Air Force said people in the San Diego area might mistake the Ryan plane for a flying saucer. However, no description of the Ryan craft was made public." The CIA was anxious to interview Russell, and its Assistant Director for Scientific Intelligence arranged to debrief him at Russell's earliest opportunity. Herbert ("Pete") Scoville, Jr. was a veteran scientific intelligence officer, having been an observer at the 1946 Operation Crossroads nuclear tests at Bikini atoll before being named technical director of the Armed Forces Special Weapons Project, an interservice agency responsible for coordination of nuclear weapons design. He had been associated with the important 1953 Strategic Missiles Evaluation Committee (better known by its code name, the "Teapot Committee"), which was staffed by such luminaries as John von Neumann, Edward Teller, Hans Bethe, Theodore von KÃ¡rmÃ¡n and George Kistiakowsky, which determined that it would be feasible to miniaturize thermonuclear warheads to a degree that could make intercontinental ballistic missiles practical. Scoville was close to the developing reconnaissance satellite projects, and after Richard Bissell's departure from the CIA in 1962, he would succeed Bissell as head of the CIA's satellite reconnaissance programs. Scoville was also known as an outspoken opponent of "human intelligence" as a reliable means of gathering information on the USSR, and probably went into the interview with rather low expectations. Scoville's major concern was that Russell had been a victim of some sort of Soviet hoax, designed either to convince the American group that some sort of launch site existed between Baku and the Iranian border, or to make them think they had seen a Soviet saucer, as unlikely as that might be. Carefully interrogating the Senator on October 27, the day after his return to Washington, Scoville began to conclude that Hathaway and Ryan's version of the story, which had alarmed the Agency, was inflated in many respects -- biased toward an image of a vehicle unwarranted by the observations. It was the first formal debriefing for Russell, who had not had a chance to verify Ryan's cable in Prague. Bit by bit, the CIA officer was able to deconstruct the implications of the Ryan cable. Only Efron had actually claimed to have seen an object take off from the ground -- he described the liftoff of the second light as a missile-like "ejection" -- and Russell had seen no detail on the lights whatever (but remarked helpfully that the others' eyesight must be better than his). One point in Ryan's cable that had seemed to indicate that something of great significance had been seen was the implication that the agitated Soviet trainmen had pulled the window blinds to obstruct the view. On questioning the Senator about this, Scoville discovered that the trainmen had closed the blinds at least ten minutes after the event, when Russell was back in his own compartment. Russell did not feel that they were trying to hide anything. Scoville was encountering the inconsistencies of UFO eyewitness testimony that had frustrated investigators from Project Sign on down. He ticked off the discrepancies like a scorecard: Hathaway thought the second object had a darker, spinning outline; Russell and Efron were not so sure. Efron thought he had seen a triangular shape with three lights shoot from the ground; Hathaway saw only two lights per object, and first saw both objects when they were some distance in the air; Russell could only vouch for one light per object. 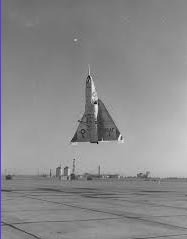 Everyone but Hathaway said the second light had followed a fairly continuous, if wobbly vertical path; the Colonel was adamant that it had made a sharp transition to horizontal flight. Gros had been trying to aim his cameras, and saw little detail in both cases. The clearly defined discus-like aircraft of Ryan's cable were evaporating like fog. The testimony of [Senator Russell's party] does not in my opinion support the theory that the Russians have developed saucer-like or unconventional aircraft. It is quite possible that the objects seen were the exhausts of normal jet aircraft in a steep climb. The fact that none were seen on the ground might indicate that the aircraft were in a dive followed by a sharp pull-up in such a way that nothing was seen until the exhausts were visible to the observers on the train. However, it is possible that the aircraft were indeed of the short or almost vertical take-off variety. He might have been thinking of something like the steep-climbing Soviet "flying rhomboid" which had been reported earlier in the year. Scoville probably had an additional reason to discount the existence of Soviet saucer-like vehicles in the Baku region. The proximity of the site to the Iranian border would have facilitated the monitoring of the radio traffic generated by an operating military facility, particularly a missile or fighter base, as well as the emissions of the radar equipment invariably associated with such a site. The closest known major ballistic missile test facility was Kapustin Yar, about six hundred miles north of Alyat, and ironically, the party had been in the vicinity that installation just a few days prior when they were visiting Stalingrad. The Baikonur ICBM test site in Kazakhstan where Sputnik would be launched exactly two years later was probably not yet in existence. Scoville advised Allen Dulles that based on his interviews with Russell, he did not believe that the Soviets had developed a radically unconventional aircraft. Available documents give no hint that anyone in the intelligence community considered the possibility that the objects had been anything but human-made devices.